A Bit Flip That Killed? During my bitsquatting research I was amazed how many critical RAM chips in a typical PC lack error correcting memory. It turns out that ECC is missing from an even more critical device: cars. Details from the recent Toyota civil settlement show that the drive-by-wire control of Toyota cars was lacking error detection and correcting RAM. Although the investigation focused almost entirely on software, there is at least one HW factor: Toyota claimed the 2005 Camry's main CPU had error detecting and correcting (EDAC) RAM. It didn't. EDAC, or at least parity RAM, is relatively easy and low-cost insurance for safety-critical systems. I can't fathom why that would ever be the case. The amount of RAM required is relatively small, and the extra cost is inconsequential to the total cost of a car. Oh, and the software runs next to a car engine. "We've demonstrated how as little as a single bit flip can cause the driver to lose control of the engine speed in real cars due to software malfunction that is not reliably detected by any fail-safe," Michael Barr, CTO and co-founder of Barr Group, told us in an exclusive interview. Barr served as an expert witness in this case. Drive-by-wire systems aren't the only critical control systems susceptible to bit-errors. There is some speculation that a bit-error caused a sudden altitude drop in a Qantas A330. Amazingly, airplane software systems did not have to consider single or multiple bit errors until 2010 (see page 222) to achieve certification. Finally, a topic to unite my two most popular blog posts: git failures and bitsquatting. It is quite amazing to see evidence of a bit error resulting in a perfectly innocuous, syntactically valid and yet completely erroneous change in a real program and a real codebase. How many times does this happen without anyone noticing? Tomorrow morning I will be giving a demonstration of Binfuzz.js at Blackhat Arsenal 2013. Please stop by the Arsenal area from 10:00 - 12:30. The slides are already available on the Blackhat website. The Binfuzz.js page on dinaburg.org is now live, and all the code is uploaded to Github. Several predefined elementary types: Int8, Int16, Int32 and Blob. File Offsets (e.g. field A = how far from the start of the file is Blob B? The ICO fuzzing example includes uses of all of these because I needed them to implement ICO file generation. Binfuzz.js calculates the total number of combinations based on how many possible combinations there are for each individual field. It is then possible to generate a structured data instance corresponding to a specific combination number. It is not necessary to generate prior combinations. This way random combinations can be selected when fuzzing run time is limited. This isn't an overly technical post but I hope it saves someone hours of frustration printing on Linux. In my case the problem was a combination of broken generic printer drivers and a bad default value for the "Print Quality" setting. As a word of caution, according to the Anna Karenina Principle odds are your problem is its own unique snowflake and this wont help you print. You are trying to print from Linux. The printer starts, makes printing noises, but only a blank page (i.e. one with no ink on it) comes out. You verified your printer works by printing from another OS. If you have not, do this. If your printer still prints blanks on Windows/MacOS, you have a printer problem, not a Linux problem. The solution is two part; both parts were needed to actually see ink on paper. The drivers that came with CUPS and claimed to support my printer didn't work. For HP printers, you need to sudo apt-get install hplip, and run hp-setup. If you have another brand printer, look here for help. 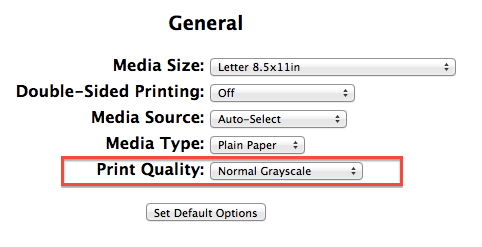 Change the "Print Quality" setting to something else. Change the Print Quality setting to something else. Try all the values. For me Normal Grayscale worked, Normal Color did not. Try all the Print Quality options. Hopefully one of them prints. Yes, the setting is hard to find to and obscure, but hey, at least you didn't have to edit another config file! My next post may be about trying to get network printer sharing to work between Linux and Mac OS X Mountain Lion, which was its own struggle.